Passive intermodulation (PIM) is one of the main causes of faults in modern networks. PIM can significantly reduce the network quality with regard to range and data transmission. PIM is caused by a number of factors, some of which include inadequate installation, poor component quality, or site-specific elements. 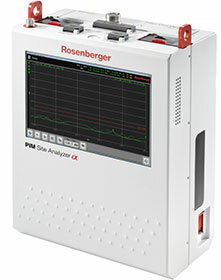 The Rosenberger portable and multifunctional, broadband PIM Site Analyzer is an alternative way to perform accurate, stressed PIM tests on site. By detecting and eliminating interferences, higher data rates, shorter response times and increased network quality can be realised. The instrument consists of a single master unit with band-specific and interchangeable filter units. No calibration is required when interchanging filters on site. It offers easy plug-and-play setup and covers a frequency range of 700 to 2700 MHz. Its continuous wave (CW) signal simulates real operating conditions of the base station (in conformity with IEC 62037-1). The analyser upholds accuracy of down to 0,3 m for PIM Distance to Fault (DTF) measurement.